Bill French, Linda Hedstrom, Dave Singleton, Anita LaRan, Yolanda Garibay. "People are a community’s most important resource,” according to Starry Krueger. “Most government funding for rural areas is targeted on physical infrastructure or agricultural production and marketing. We focus on the human infrastructure." RCAC’s chief executive officer Stanley Keasling said, “Leadership development has been a secondary focus of RCAC for much of its history. One of the recurring themes that we heard during a recent symposium on rural development was the need for new leadership in rural America. It’s fitting that we would recognize Starry when the need for her efforts is so critical." Bill French has assisted RDLN by making presentations at the RDLN Rural Development Institutes at the University of California at Davis. During one of these visits, he met RDLN Leader Anita LaRan, who subsequently was invited to join the RCAC Board of Directors and served for twelve years. 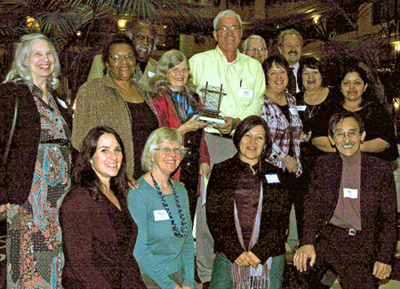 The Rural Community Assistance Corporation (RCAC) a Sacramento-based nonprofit organization dedicated to assisting rural communities, presented the 2009 William French Award to RDLN president Starry Krueger for her leadership role in rural development. The William French Award was created in 2007 to honor the life of William (Bill) French, RCAC’s CEO for its first 30 years. 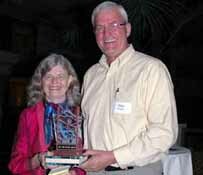 The award is given for lifetime achievement in leadership in rural development, building and sustaining an organization that benefits rural communities, and having an impact that goes beyond a single community. Krueger has worked with diverse leaders throughout the country to create and sustain the Rural Development Leadership Network (RDLN), which was founded in 1983. RDLN graduates have distinguished themselves and have achieved outstanding recognition nationwide.